I went to a birthday party recently and the vegan finger food was just wonderful. Most of it was made by a friend of the hosts and a couple of dishes in particular were standouts. These cauliflower bites were probably my favourite and I came home on a mission to recreate them. There are a large number of recipes for buffalo cauliflower around on the internet. I settled on this one with some variations, substituting fresh garlic instead of powdered and using some smoked paprika. I also used lime juice instead of the vinegar in the ranch dressing. I spiced them up by using Sriracha instead of Frank’s Hot Sauce in the marinade. Sriracha is five times as hot as Frank’s, 2200 vs 450 Scoville units (the measure of chilli heat). I like chilli so it was fine for me. They are delicious and completely moreish. Lift the cauliflower pieces out of the bowl with a fork to drain any excess batter and place on a single layer on a tray lined with baking paper. Make the ranch dressing by mixing all the ingredients together. Serve the bites with ranch dressing as a dipping sauce. Oh yum! I like that these are baked rather than deep-fried, much less of a hassle. They are great. Deep frying is a pain, though delicious. But these don’t suffer at all by not being fried. that blend of flavours everywhere looks fantastic– definitely seems the kind of dish where you can polish off a massive head of cauli in one sitting! Delicious! Just what I need. Vic Market Organics had cauliflower halves that were bigger and much cheaper than their whole caulis. Now I have a ton to get through, and I’m sure we’ll polish this off and still be looking for more! I just love cauliflower season. 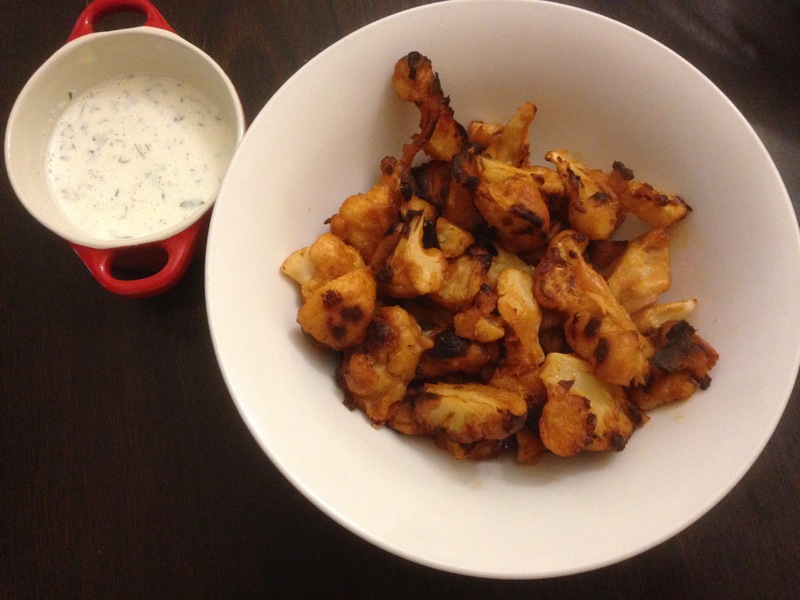 How funny, we just tried buffalo cauliflower at home for the first time last week! It was deeelicious. I like your variations, and will definitely have to make a ranch sauce to go with ours next time. They sound amazing, although I might have to cut back on the amount of sriracha, where do you get sriracha from, love your blog, one of the best around the vegan scene. You can get Sriracha at Asian groceries and mainstream supermarkets.